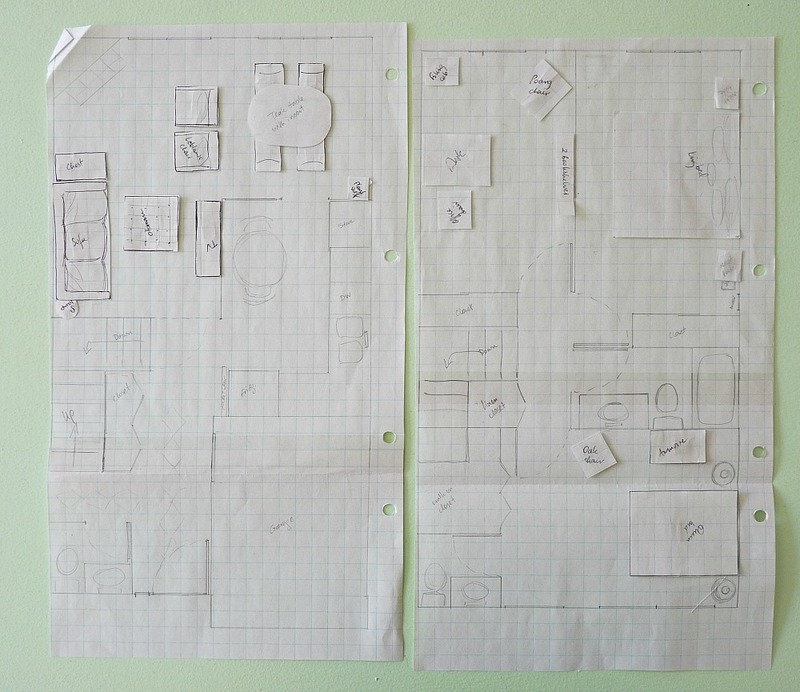 I know there are a million online floor plan generators out there, but I like my old-fashioned way: my Mom draws a scaled version on graph paper, then I measure my furniture and create scaled cut-outs which I colour with pencil crayon. When else will I get a chance to bust out my pencil crayons? 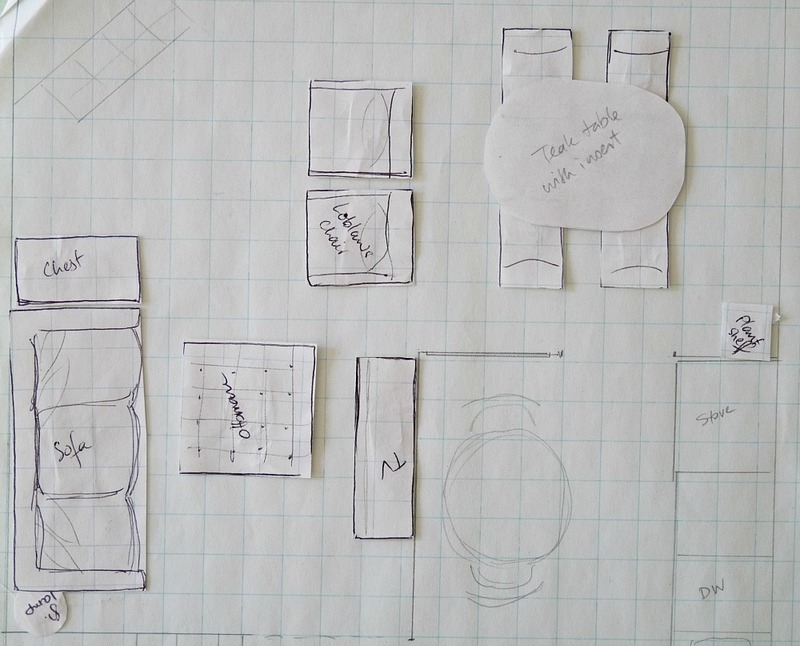 I’ve been working on more detailed plans for the lakehouse, especially layouts. I want to figure out what furniture will transition and what won’t work, so I can sell things before the move. Also, we’re moving to a much smaller city, so now’s my chance to source things I might not find there. I’m getting organized! pointing toward the television so I can watch Rookie Blue. 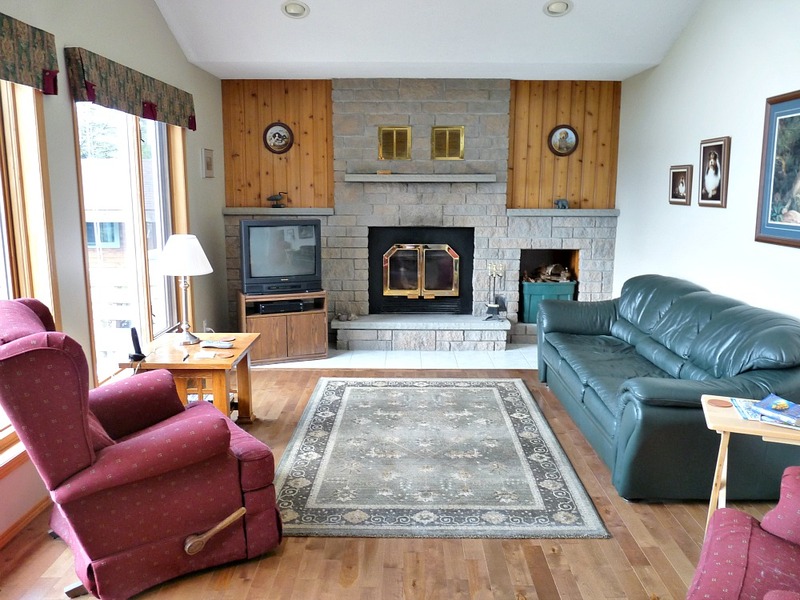 There’s no room above the fireplace for the television because that’s where the fireplace vents that circulate the heat are located. There’s no room on either side, either, unless I want a smaller tube TV shoved into the corner (hear that? That’s Hubby sobbing at the thought). And then there’s a wall of windows . . . The sofa will be against the windows but pulled out a foot or so. 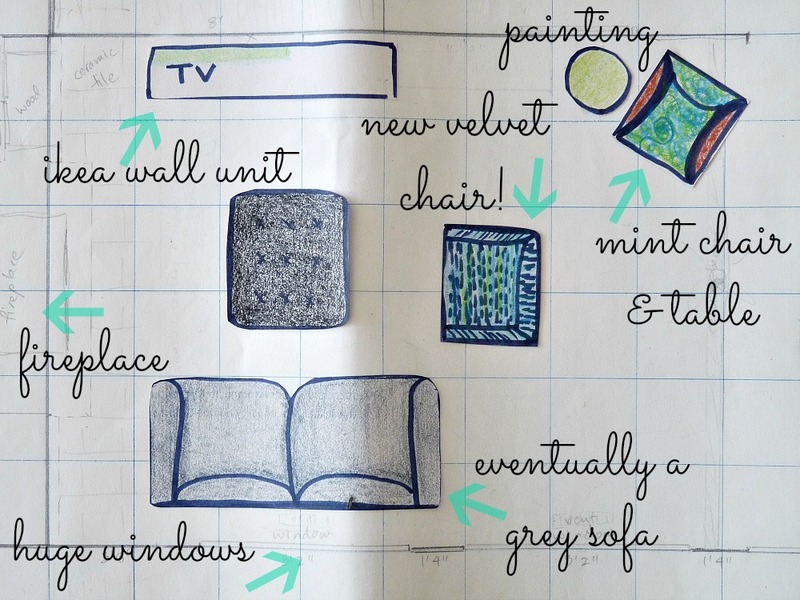 Our Ikea wall unit will make the trek with us and live opposite the sofa. We’re ditching the teak side tables in lieu of handmade ones that will tuck in closer and higher (bottom left). We’re moving the mint chair, mint table and one of my favorite paintings of Hubby’s grandpa’s into the living room to create a little lake-facing-nook beside the wall unit. We thought about a sectional, but with a sofa and accent chairs, we can move the chairs to face the window when we want to relax with a book and stare dreamily at the waves. The soon-to-be-made-over velvet chair will take centre stage. 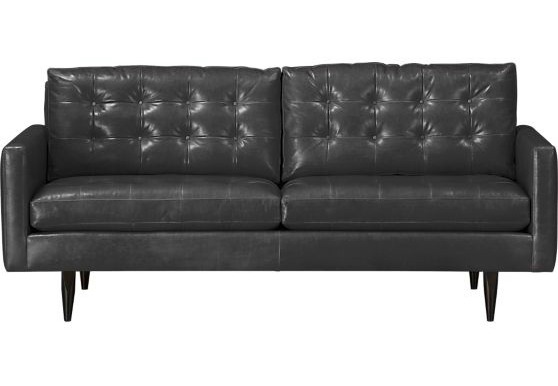 Eventually I hope to get a grey leather sofa that is lower, with more mid-century lines, to replace our cream one. In the meantime, we’re planning to make or buy a new ottoman in a more modern shape and fabric. matches the exterior of our house. For now, the gold will get de-goldified, the ceiling fan and dining room light are first to hit the chopping block, and we’ll say good-bye to all of the skinny oak trim! Any volunteers to paint out the trim on those top windows? working on the lakehouse because we have not sold the townhouse yet, but I don’t mind: it’s giving me a chance to get prepared. I need to keep repeating that so I don’t start feeling antsy about the uncertainty. I hate uncertainty, but sometimes good things come from it. For a little distraction, look how adorable the original townhouse plans look! I saved these from 2009. The ottoman is the only piece of living room furniture that is the same. 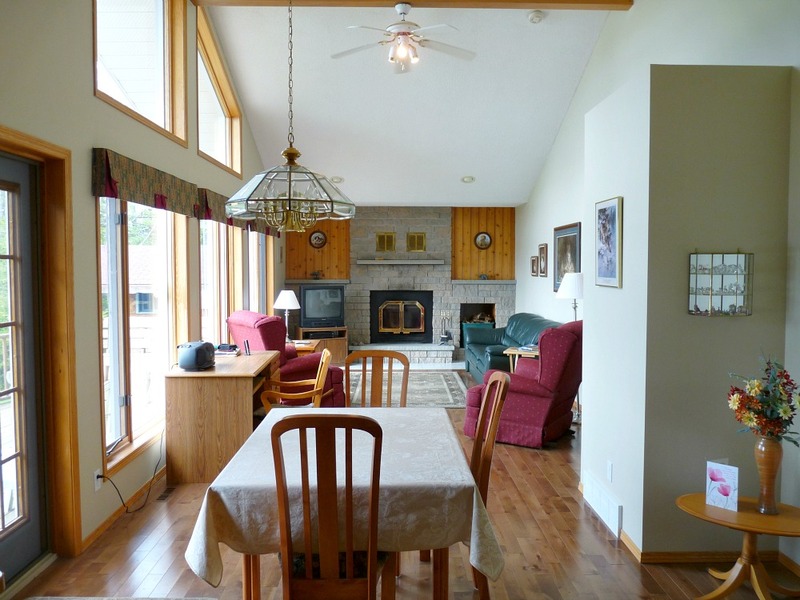 But the dining room table and chairs are identical (just oriented differently). Previous Post July is Done. Did We Have Fun? Hooray, another Rookie Blue fan! I forgot to watch last night but thank goodness for PVRs. I can't wait until you guys start moving into your new place! Andy and what's-his-face really need to get together already now that Peck has dumped him. Amen!!! I sure hope they do get together. So close last episode! Why does she need to think about it??? I hate when shows draw that stuff out too long . . . grrrrr. I hate online room generators. They feel cold and impersonal. I love the idea of busting out the pencil crayons and drawing to scale. 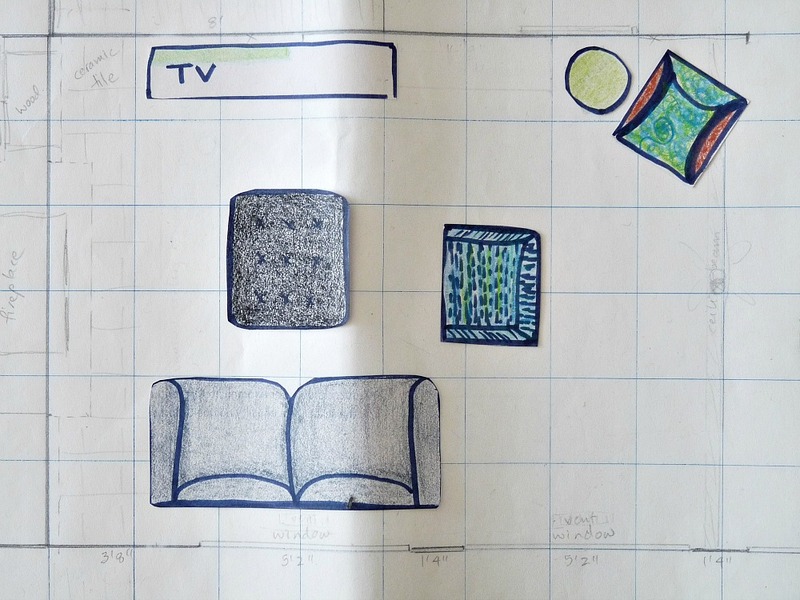 Ooo, I'm so terrible at envisioning rooms. (I'm a designer, but only in 2D!) I can't wait to see what you do with the place. My parents had a big lake house once upon a time and they created a media room which was really great for going and watching movies since it had blackout curtains and comfy couches. It was also great for sending little visitors who got too noisy for the adults who wanted to chat and admire the view. But it's kind of a sacrifice of a room to go that route. I'm pretty good at imagining rooms because I see past the reality and in to the potential immediately but then I'm terrible at remembering that chairs need room to be pulled out! This helps me be more realistic. 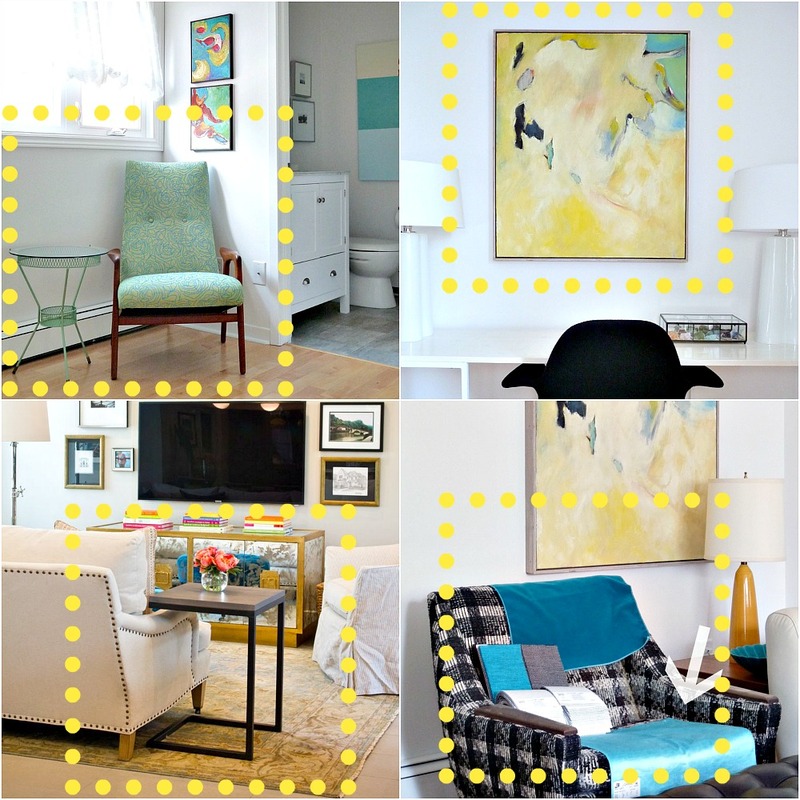 When we bought the townhouse, I spent so much time envisioning our changes that when we finally moved in I forgot it still looked terrible and needed us to make the changes!I love the idea of a media room, but we don't have any spare rooms – not even a basement! Although I did toy with the idea of buying a projector that could come down in front of the windows at night for viewing but that's just too pricey for us. Maybe when we're living in the space for awhile, we will have some genius idea(s)! Me neither! Wish it would makeover itself because those high ceilings are terrifying me! "Pencil Crayons" has got to be the most adorable Canada-ism I've heard to date. At least I assume it's a Canadian phrase? What if the rest of the world says "pencil crayons" and the USA is the odd man out, saying "colored pencils?" … But I digress. I use online floor planners because I suppose I'm too lazy to cut everything out and make it to scale… however I really, REALLY like the idea of doing it with paper. Maybe next time I'll make my own little cutouts like you did! I had to google this, to make sure it's not a Tanya-ism! LOLApparently, it's a debate as to which to use! http://nerdfighters.ning.com/forum/topics/is-it-more-commonly-referredI am guessing it is a Canadianism.The cut-outs are fun. But truthfully, I'm lazy too. Notice how my Mom did the heavy lifting, and I just did the doodling? Haha. 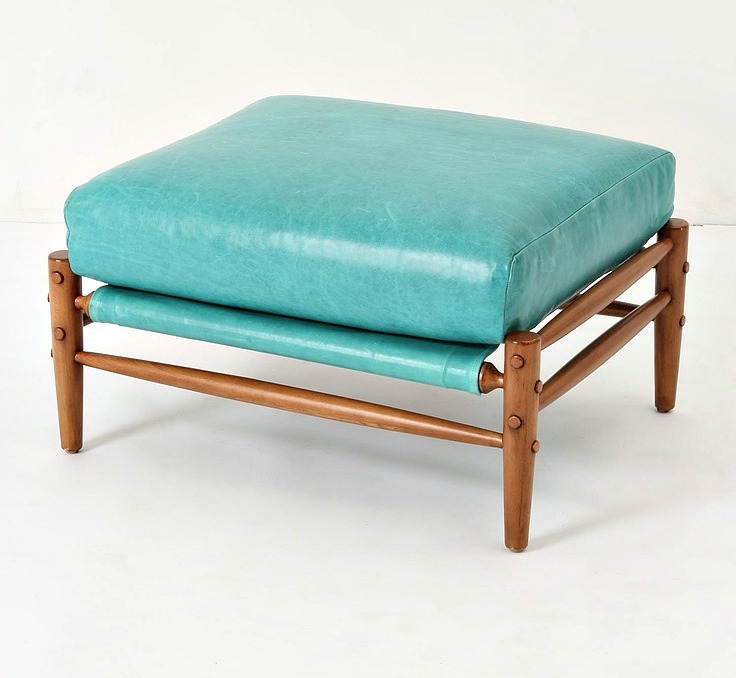 that anthro ottoman is making my mouth water! look at you planning ahead. i wish i would have done that, we have so much furniture i would have liked to sell to buy new stuff…now its taking me forever! Isn't it freakishly gorgeous?? ?I'm trying to capitalize on a bigger city where there's a bigger market and people will actually pay money for things. Where I'm going, $1.00 is too much to pay for a chest of dressers at a yard sale, lol. I kid, but it's not far from the truth. A city of cheap skates 😉 I'm hoping to sell as much as I can now to buy some really gorgeous staples for the new place (like the velvet fabric I just ordered, yipeee). This is the really fun part! I love working with little cut-out pieces of furniture too. It is such a fun part! Cutting them out was weirdly soothing too. Such a fun way to unwind. And now I've taped them down, so I don't lose them. OMG Where has that sofa been all my life! I like your floor plan guide… Cut outs! Looking forward to your new place. By the way, your fireplace is it electric or not? The fireplace is wood burning, but it has an insert that helps circulate the air so it's more efficient and heats the room much better. Ahhh I see! Nice idea… ours is electric but planning to make it wood burning just in case of black out. Thanks for the info. That's a great idea! I know gas fireplaces are popular but we currently have a wood burning one and I love it. I wanted our lakehouse to have a wood burning one too. I have this crazy idea of cooking over it if the power is out. Or in an apocalypse, lol. Good luck with the conversion, I hope it goes smoothly! You are such a smart cookie! I love how you are organizing everything. There is something about old fashion pencil and paper you just can't capture with digital. Thanks for giving us a peek at what you have planned ahead. PS. If you get any takers on painting the high trim, send them our way after. Haha, I'm hoping to rook my Dad into painting but he, Hubby and I are ALL afraid of heights!! We'll see how that goes . . .